For the past 50 years, the “follow the freeways” adage has held true in California. The recent completions of the SR-125 tollway, and SR-905 freeways connects Otay Mesa and the International Port of Entry to the Interstate highway system, providing Otay Mesa with two major new transportation catalysts to drive continued growth. In addition, the new Community Plan Update was adopted in early 2014, creating a clear road map for Otay’s future land use and planning. 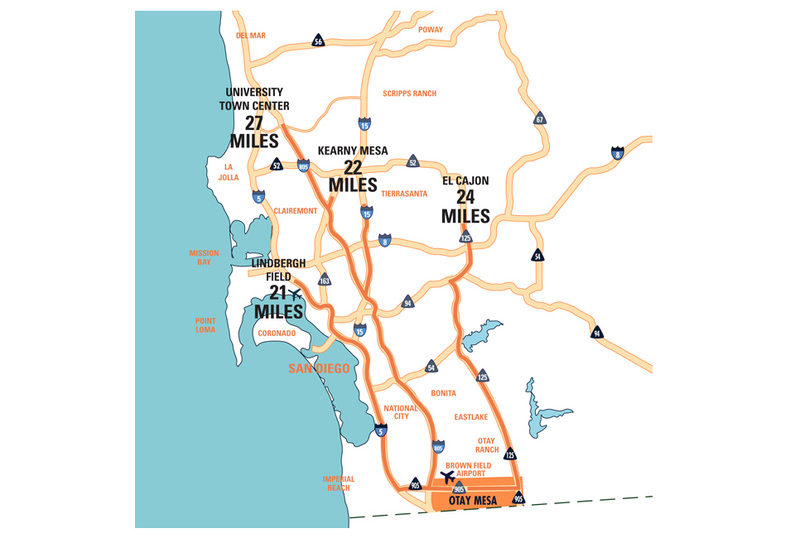 Otay Mesa is strategically located closer to the CBD and Lindbergh Field (approximately 20 miles) than any other major San Diego industrial area. Otay Mesa is also at the very center of San Diego’s largest labor market – South County and Tijuana – a major advantage to all manufacturing and other companies. Otay continues to be the most cost effective solution to the space needs of industrial companies in greater San Diego. South County, including Otay Mesa, represents 16% of the total San Diego industrial market of 188.85 million SF, yet will capture an increasing share of annual absorption going forward due to severe land constraints in other areas of San Diego. 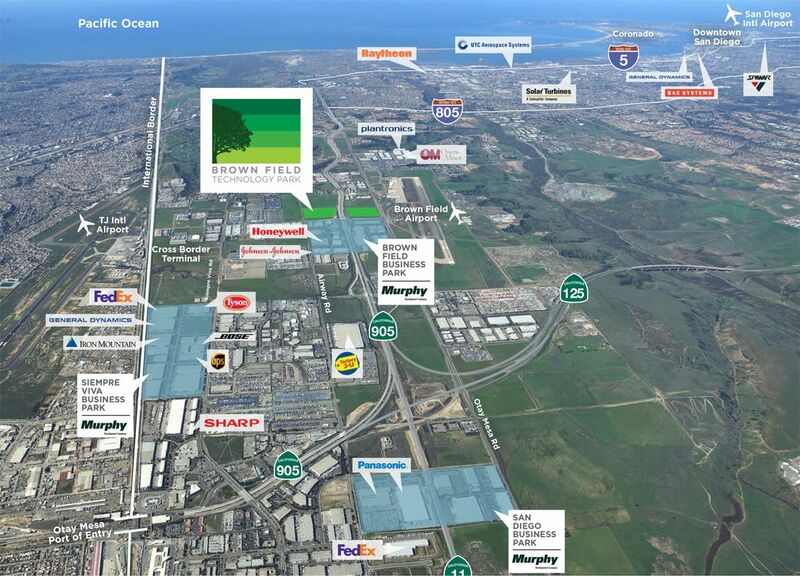 Murphy Development owns the largest entitled site in Otay Mesa, the Brown Field Tech Park. The new San Diego-Tijuana Airport Connector, the Cross Border Xpress (CBX) has been completed. (http://crossborderxpress.com/) CBX is an enclosed pedestrian skybridge that spans the U.S./Mexico border, connecting a new passenger building in San Diego directly to the Tijuana International Airport (TIJ). The redevelopment of the Brown Field Airport is slated to begin soon. Plans for the 330 acre redevelopment include a new FBO, jet and small aircraft hangars, hotels, retail, and commercial space. 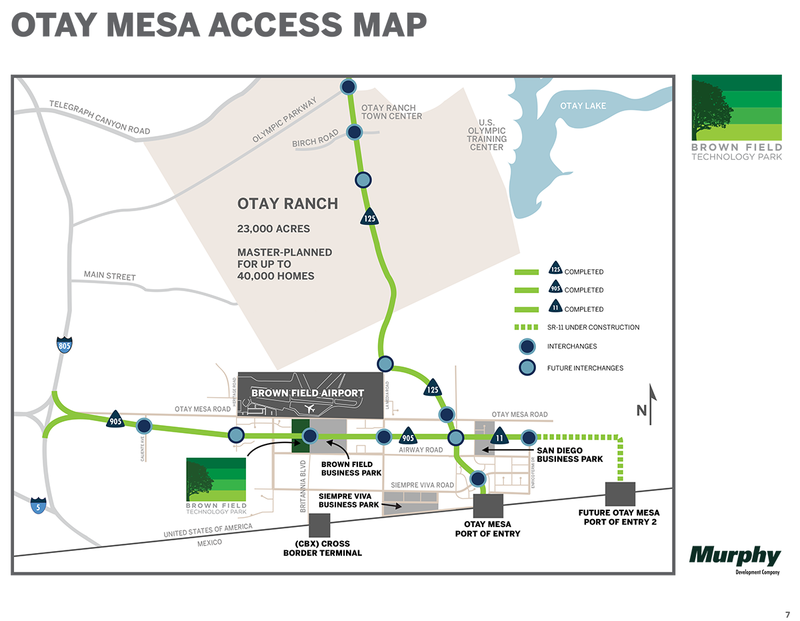 Otay Mesa is set to receive its second commercial border crossing, Otay II, just east of the current crossing. Construction is underway on State Route 11 that will connect the 905 freeway and the 125 freeway to the new crossing. Completion of the project is currently anticipated to be 2018.